Do you own or manage a number of WordPress sites on different domain names? 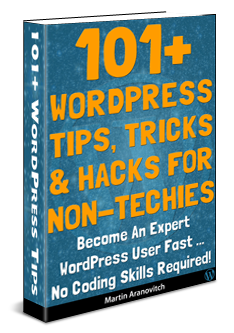 If so, then you probably already know just how much work it can be keeping track of multiple WordPress installations and ensuring that all sites, plugins, and themes are regularly maintained and kept up-to-date. 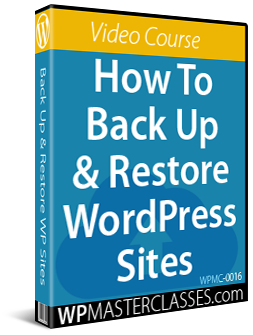 Despite all the hype and promises made online when it comes to tools that can help you manage WordPress sites, there is no “one-click” solution that can perform a complete and thorough WordPress maintenance routine or at least anything that will keep multiple WordPress sites completely up-to-date and fully backed up automatically. 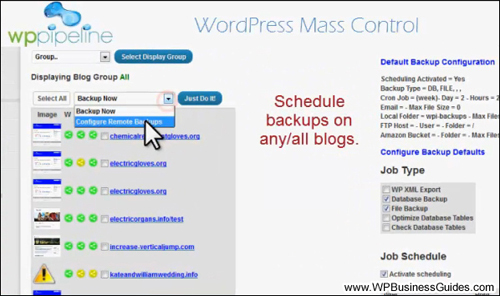 WP Pipeline, however, comes very close to being a “one-stop” multiple WordPress site maintenance and management solution. If you currently manage or plan to manage multiple WordPress sites, then you should consider investing in WP Pipeline. 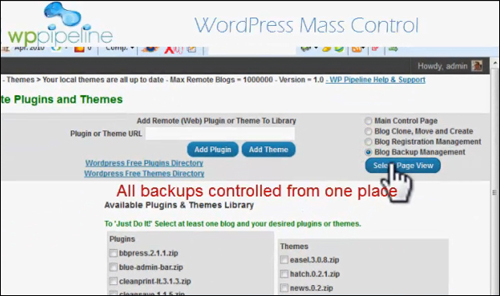 WPPipeline can also be used to manage a single WordPress site. These features are explained in more detail below. 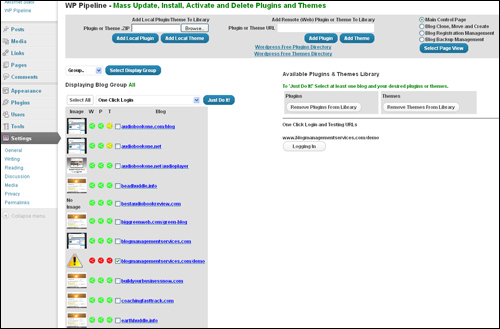 If you plan to build multiple WordPress sites on a single domain, then consider using WordPress Multisite (a built-in feature of WordPress). WP Pipeline was developed by Tony Marriott and Ben Shaffer, two successful internet marketers with an established reputation for building quality software products and providing great customer support. 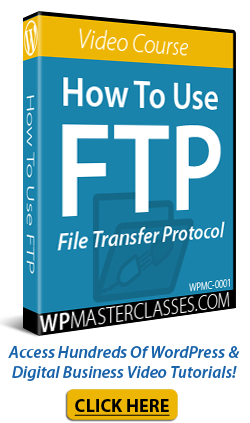 As WP Pipeline users get access to training videos and a step-by-step user guide when they purchase the software, there’s no point reproducing the training documentation here. 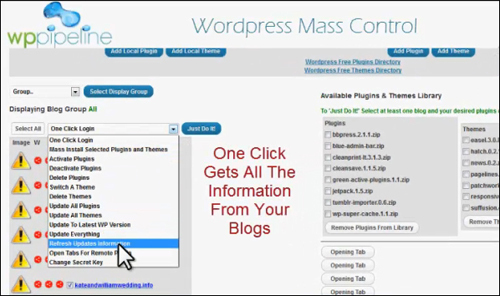 Instead, we provide an overview of the plugin’s features and links to the plugin’s website. WP Pipeline is a WordPress plugin that you install on a separate WordPress site in any domain name that you own. Further below in this tutorial we also discuss methods for ensuring that your installation remains private and securely protected. Since you are going to be storing all of your WordPress site passwords, ensuring that your information remains secure is the utmost priority. WP Pipeline offers a simple, but extremely powerful and secure method to protect your details from hackers and unauthorized users by using a “secret” key. 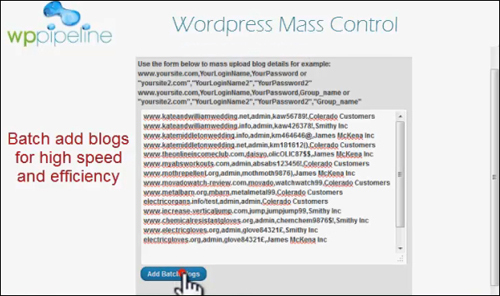 Your secret key will be used to encrypt all site password information stored in WP Pipeline. It is very important that you remember your secret key as you will need to enter it each time you use WP Pipeline. The secret key is never stored on, or passed to, the server and will expire as soon as your browser session is finished (i.e. when you close your browser or turn off your computer). You can have a secret key up to 128 characters so a memorable sentence is a good way to think up and remember a secret key. You can change your secret key at any time but you will need to remember the current secret key to that. Only you will know your secret key. If you lose it or forget it you cannot retrieve it as it is not stored anywhere. You will need to delete and re-install your site again if you do. 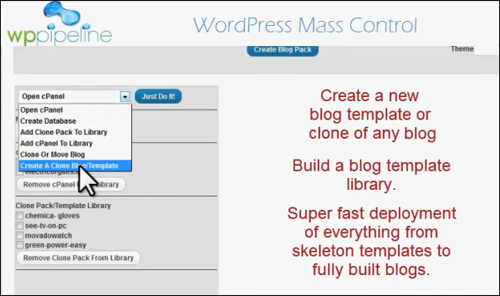 Create a new site template or clone of any blog. Build a blog template library. 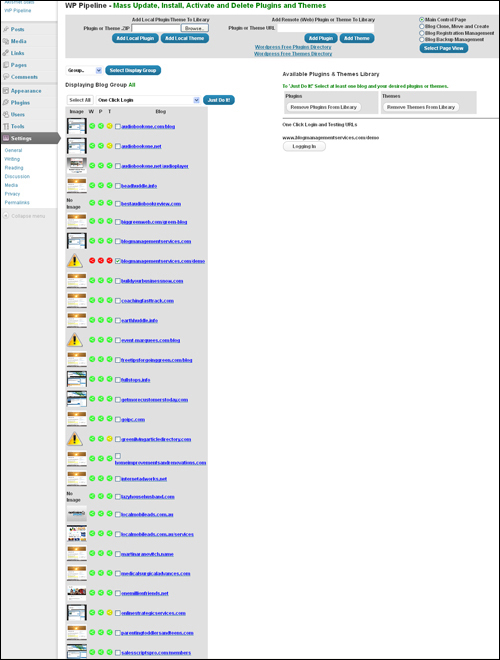 Super fast deployment of everything from skeleton templates to fully built sites. 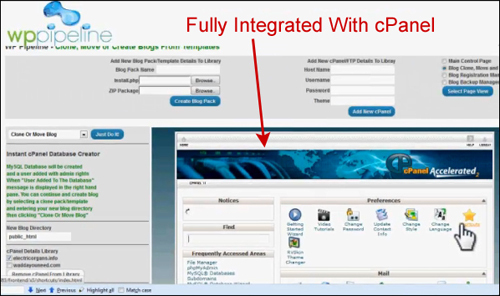 Note: cPanel is not required for the WP Pipeline plugin to work. 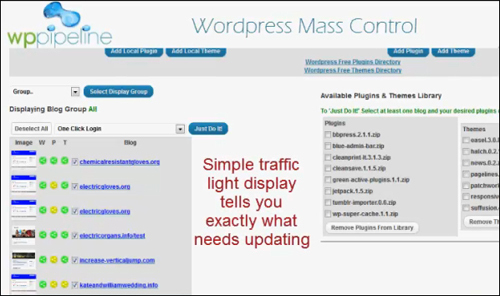 When any of your sites need to be updated, you will be informed on your dashboard. You can then choose to just update that site, or update any sites that need to be updated. If you want to upload a new theme or plugin to one of your sites or to multiple blogs, then you can do this in just a few clicks from your dashboard. 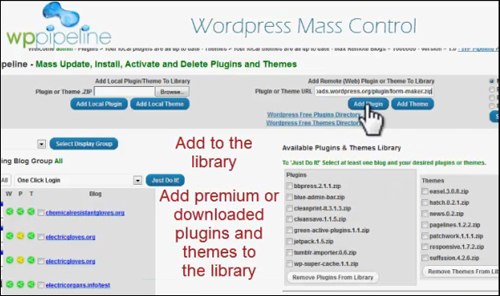 You can also deactivate plugins or themes in the same way. 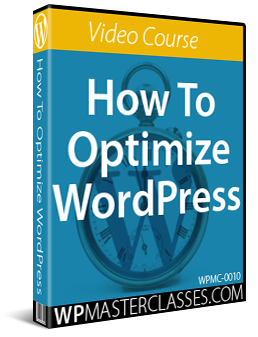 This works the same way with either single themes or plugins or multiple themes and plugins. If you want to create a new site with a particular set up, then you can do this from the main dashboard in just a few clicks. 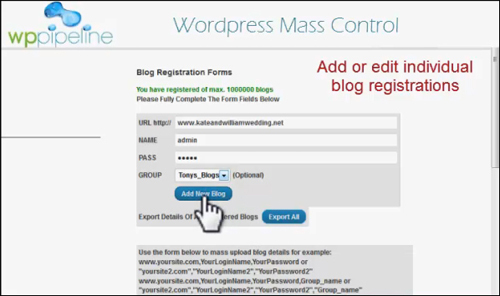 You are able to create and save multiple profiles which are based on sites that you already have. 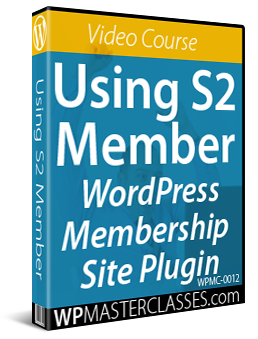 This is particularly powerful if you want to set up a large number of sites with the same setup. Sometimes you no longer want to use a theme or a plugin on your sites. By clicking a few buttons, you can deploy this across all of your selected sites. 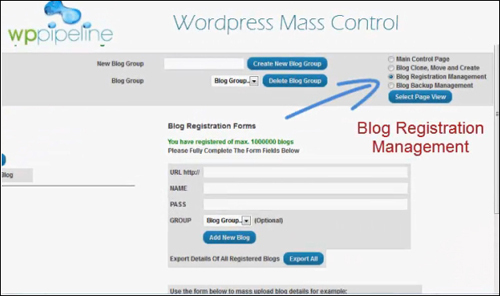 You will often find that you have different kinds of sites that you want to put into groups. Or, perhaps, you have different clients and want to keep them separate. 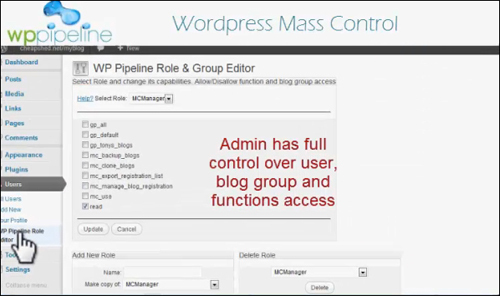 WP Pipeline enables you to create as many groups as you like and put all of your different sites in different groups. 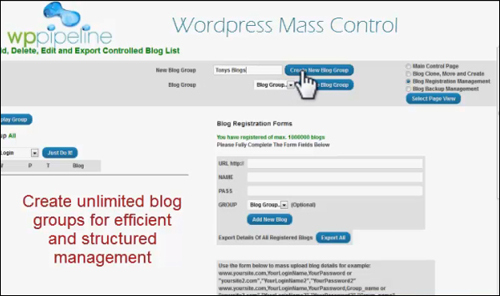 You can then pull up just the group of sites which you want to manage. This is an incredibly powerful feature which allows you to give multiple users access to your dashboard. Each one can have different permissions on what they are allowed to do and what sites they have access to. This is very useful if you have clients, employees or even if you want to sell certain sites and give them temporary access. 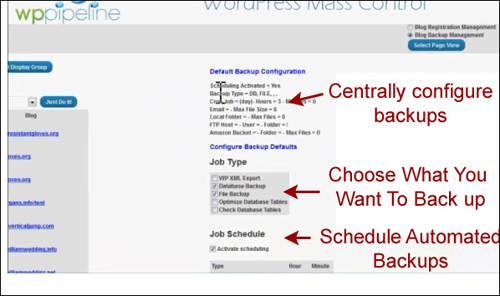 From one central location, you can set up scheduled backups for your sites so that if tragedy does happen, then you can easily restore the backup. WP Pipeline makes it extremely easy to add or delete sites from your dashboard. You probably have a lot of plugins and themes that you have bought or use regularly. 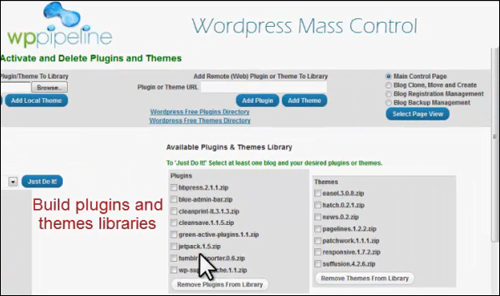 WP Pipeline will enable you to keep a library of all of these plugins and themes so that you can easily find what you want. 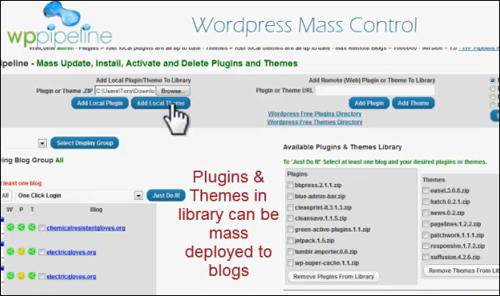 This section contains additional information on using WP Pipeline to manage your WordPress sites and new WordPress installations. WP Pipeline Master plugin should be installed on a fresh clean WordPress site. Install a new WordPress site on a subfolder of a domain that you own (e.g. yourdomain.com/subfoldername). Give the subfolder where you plan to install the new WordPress site an obscure name that only you will know. 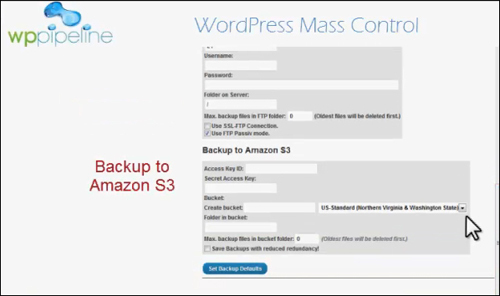 The WP Pipeline Slave plugin will also install other integrated plugins like Duplicator and BackWPUp. 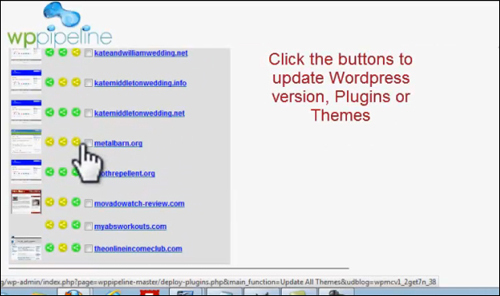 If these are already installed on your target (slave) site then simply deactivate those plugins. The integrated versions with WP Pipeline will automatically pick up any settings you have already made and give you central control of these features. The plugin uses ionCube to protect some of its core code. 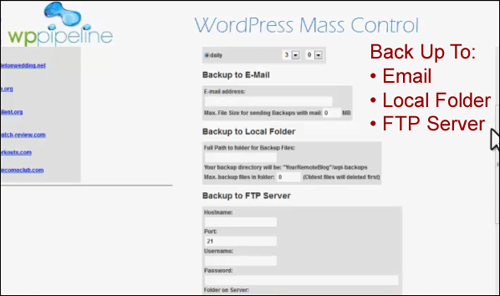 This helps protect the plugin developers against piracy and WordPress users against hackers. However, this means that a file called the ionCube loader must be installed on the same server where your WordPress sites or blogs are installed. Most mainstream webhosting companies will already have this loader installed. If not, it’s easy to ask your server provider to turn it ‘on’. 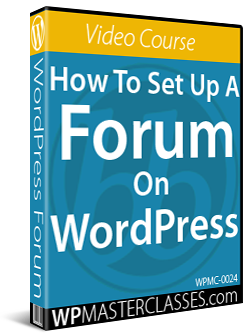 The WP Pipeline User Guide provides additional instructions for using the plugin with specific hosting companies. It also contains troubleshooting instructions if you experience problems related to the ionCube loader. If you get a loader error message when installing or activating your plugin, refer to the User Guide. For example, you may get an error message saying that there is no loader installed or that the wrong (older) version of the loader is installed. 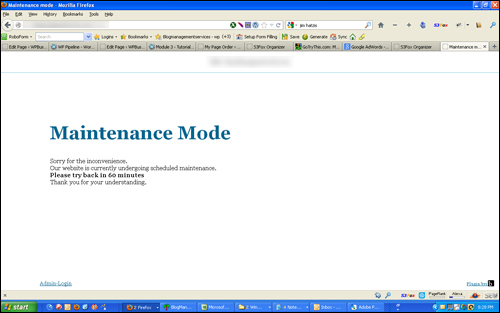 In either case, you should contact your web hosting support and ask if the ionCube loader can be installed or updated. 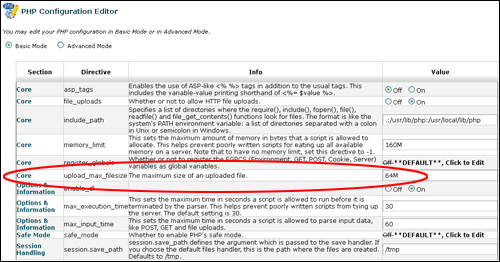 The loader should be kept up-to-date in the same way as the PHP version or Apache version etc. so it should be normal practice for your host to keep this updated. If you get an error message similar to the one shown above, then ask your host to change these settings in your PHP Configuration Editor. Finally, WP Pipeline also requires a valid license configured for the domain name you intend to run the application from. 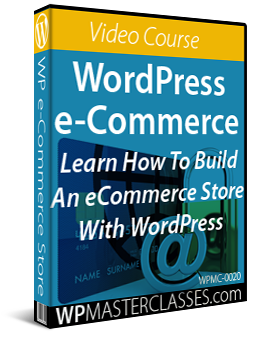 After purchasing your copy, you can register the domain name in your WP Pipeline members area. You will then receive an activation code for your plugin. WP Pipeline is well supported and comes with step-by-step documentation (User Guide and video tutorials) that show you how to install, configure and use the plugin. These are all accessible in your member’s area after purchase. 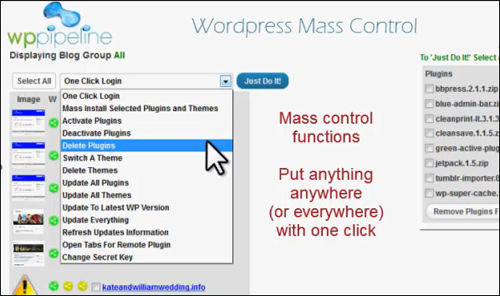 Originally published as WP Pipeline – WordPress Mass Control Plugin.